> Intel Security > Should IT Vendor Consolidation Extend to Endpoint Security? 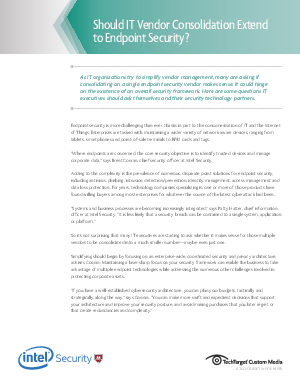 As IT organizations try to simplify vendor management, many are asking if consolidating on a single endpoint security vendor makes sense. It could hinge on the existence of an overall security framework. This white paper examines the questions IT executives should ask themselves and their security technology partners.